"We're going to figure out how to most effectively stop cities from micromanaging employment. It will cover sick leave. But it might not be limited to sick leave." 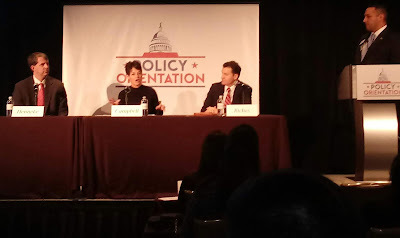 So said Senator Donna Campbell at this morning's TPPF policy orientation panel on the so-called "sick leave" entitlement the city of Austin created last year. This is good. Micromanaging the relationship between employees and employers naturally begets fewer jobs and lower wages. While the Austin "sick leave" entitlement was the latest attempt along these lines, it won't be the last. The legislature is wise to plan for the future. Campbell pointed out how complicated employment regulations empower big business at the expense of non-profits, small businesses, and startups. Big business can afford the lawyers. Non-profits, small businesses, and startups cannot. During Q & A, this author could not help pointing out that the city of Austin's ordinance is the direct, and predicable, of conservatives' failure to engage on the local level. In a room full of people wondering how such a crazy policy was passed, we were the only person was at council that night. There's a direct relationship between those facts. Former United States Senator Phil Gramm agreed. Also noteworthy: We told Senator Campbell about Wendy Davis' comments on the night the Austin entitlement passed.